Campuses across the country are using the film Crash as a way to talk with students about racism. Given this, Speak Out felt an obligation to interact with this dialogue by asserting a critical look at the film through different lenses and from varied perspectives. 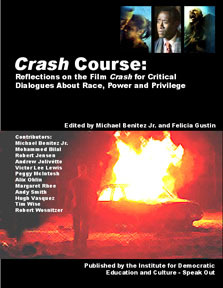 The result is Crash Course: Reflections on the Film Crash for Critical Dialogues About Race, Power and Privilege, an 84-page collection of essays by some of the country’s most prominent anti-racism writers, scholars and activists. Undesirable Tales of Cultural Imagery in Crash: Latin Paradoxes in the Media by Michael Benitez Jr.
Interpreting Social Justice Issues in Crash: A First Year-Model for Critical Dialogue used at Lafayette College by Michael Benitez Jr.